Those of you who have read my blogs will know I have a love of the geese that visit us in the winter months bringing more than a little of their arctic life into our world. They are wonderfully charismatic, have a call that when it pierces a wild landscape in the early morning connects you to a time long since lost. 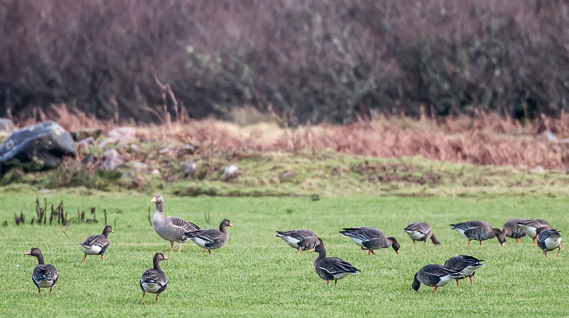 They are wary creatures and prone to disturbance and this dwindling but famous population of the genus Anser albifrons flavirostris, the Greenland White- fronted Goose, on the Dyfi had caught my imagination and I really wanted to catch up with them. I’ve seen this sub species of geese before many times on Islay and in good numbers, but never in Wales and context remains hugely important to me when catching up with any species. I have also been conscious that this vulnerable population on the Dyfi has been in decline for many years and that decline has been of massive proportion too; 83% since 1990. With a global population of around 20,000 the species is by no means in a healthy position and although not on the red list in global terms it is here in Britain. Mixed flock of Greenland Barnacle Geese and Greenland White-fronted Geese on Islay. I met Tom at the RSPB centre after a couple attempts at seeing the geese from the Ynys Feurig hide to the west of the reserve. I was in the hide before first light which made for an interesting walk with head torches across the reserve but there was no sign of the elusive eleven, as I thought there were at that stage. As the dawn departed and blobs became birds Canada geese, Barnacle geese, Widgeon, Teal, Shoveler, Mallard, Lapwing, Curlew and Shelduck showed well but I returned to the van a little disappointed but not yet defeated. 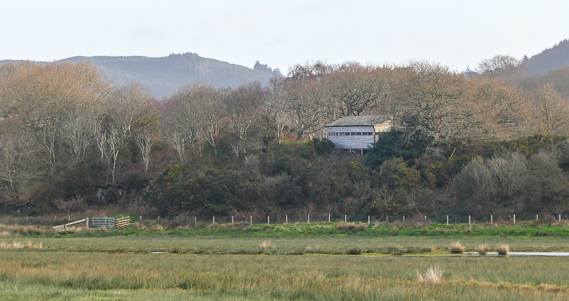 A slow drive around the fields along the Borth road proved unproductive and access to much of the salt marsh east of the reserve is impossible. I’d try again tomorrow. Maybe they would return to their roosting site at dusk. It would be worth a try. Interestingly there is, in addition to the large Islay population, another major centre of population in the British Isles and that’s at Wexford in Southern Ireland. I hope to travel over to see them there in the near future. 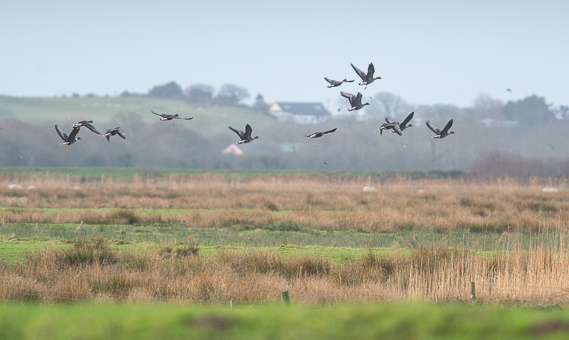 Islay holds in the region of 6,000 birds and there are around 7,000 at Wexford. There is also a connection between the Welsh birds on the Dyfi and the Irish birds at Wexford with commutes between the two populations occurring during their winter stay in Britain. This has been established by a programme of neck ringing and GPS tags and encouragingly means the Welsh population is not isolated. 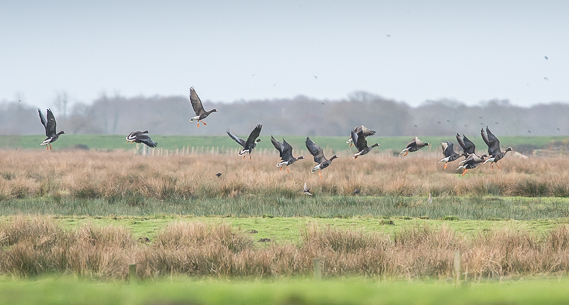 Providing perfect conditions for the population on the Dyfi a larger wintering population could be re-established and the recent 2019 ban on shooting the White-fronted Geese in Wales can only assist in reversing the recent trend. 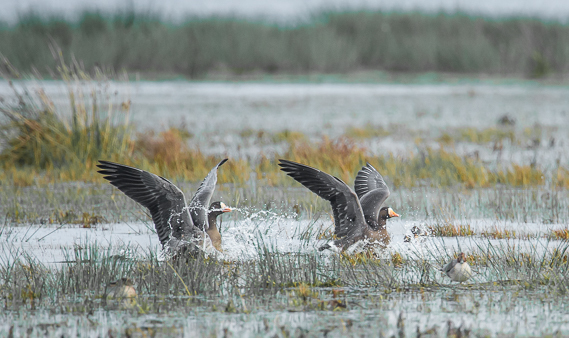 The Greenland White-fronted Geese are small fairly compact geese. The Islay birds seen here with a Greylag goose. Tom was fortunately in the RSPB centre when I visited the following morning. I’d planned to be in the Ynys Feurig hide by about 2.00pm and wait till dusk and a little beyond to see if I could catch up with them coming to roost. Two of the geese have been fitted with GPS tracking and although the data doesn’t give a live location (they are solar powered and give two location fixes a day which don’t download until the following day), they do give an idea of where they have been roosting and feeding. Tom said they had moved from their normal roosting site, viewable from the Ynys Feurig hide, to further down the coast towards the end of the outlet of the afon Cletwr and that the best chance would be to arrive there before first light. He was heading out the following morning and invited Gwenda and I to meet him there. Their migration to the breeding grounds in Greenland is, like all migratory species, astonishing and this quote from the RSPB monitoring scheme which followed one bird from the Dyfi estuary to Greenland paints a remarkable picture. She began the journey back home by leaving the Dyfi and flying over Anglesey. Astoundingly, she arrived on Mull in Scotland at 4am, flew over Rum Natural Nature Reserve at 6am and then Stornaway at 7am. By 6pm the following evening, she was recorded as having arrived at Hofn in Iceland where she will now stay with fellow Greenland white-fronted Geese for the next few weeks. The commute will then be completed when they arrive back home in Greenland. The enigmatic, beautifully marked and far travelling arctic wanderer. Islay birds pictured. 1,700 miles from the Dyfi to Greenland in early spring and back again in the autumn and a longevity of 30 years means the Greenland white-fronted Goose can total well over one and a half million miles in its life. 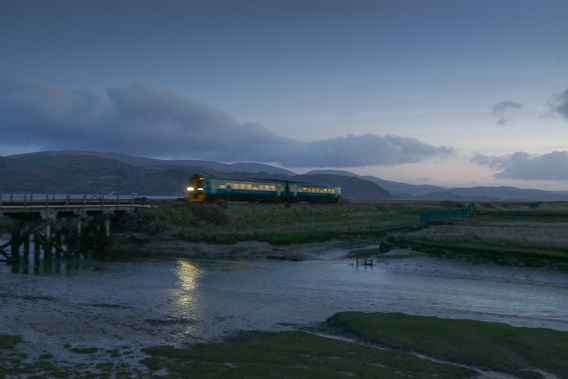 Nautical twilight on the Dyfi estuary. We had left the car in darkness. We arrived before seven the following morning and headed out with Tom and Theo (who had been working on the reserve for six months). Torches on we walked the mile out to the railway line that bisects the marsh here and waited with scopes up. 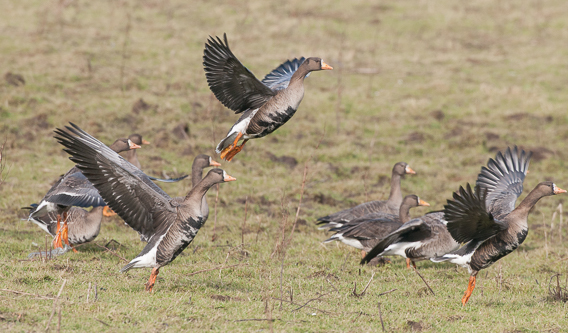 Once again blobs slowly revealed themselves to be geese, Canada’s, but could the White-fronts be there with them? Before it got light enough to discern what was what, something spooked the flock and they all rose, moving back towards the reserve. We scanned the marsh diligently at first light but no sign of them. Tom asked if we had time to join him on the reserve to try and catch up with them. We certainly did and were really grateful for another chance. The waiting game with tripods set. Like all geese the Greenland White-fronted are site faithful, travel in extended family groups with some birds never leaving the family group. 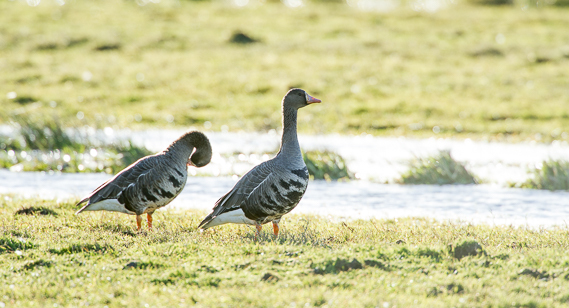 Females need to be in prime condition if they are even to attempt breeding and the stark fact that only 10% of Greenland White-fronted Geese breed successfully, is at the heart of the issue of their decline. It also emphasises the importance and quality of their wintering grounds. If the birds are not in good condition when they leave the wintering grounds then they will simply not even give breeding a go when they arrive in Greenland. If not in prime condition the Greenland White-fronted Geese will not attempt to breed. The Dyfi birds are monitored via stomach profile as the time gets close for their migration. Islay birds pictured here. The RSPB in conjunction with the Welsh Government, The Wildfowl & Wetlands Trust, Mick Green, Natural Resources Wales, The British Association for Shooting & Conservation and the Dyfi, Mawddach and Dysynni Wildfowlers Association are working to establish where the Dyfi birds are feeding and what their specific demands are. With this detailed information it’s hoped that the current decline can be reversed and these wonderful wanderers from the arctic can become a regular sight on the Dyfi estuary once more. Wintering grounds must be perfect for the geese to thrive in their breeding grounds in Greenland. The ‘partnership’ in Wales is striving to understand their very specific needs. Islay birds pictured. Back at the reserve we jumped into a 4×4 and headed off out beyond the old breakwater hide, not in use now as it’s in the heart of the feeding grounds of the geese and it’s vital that they are disturbed as little as possible when feeding during the day. 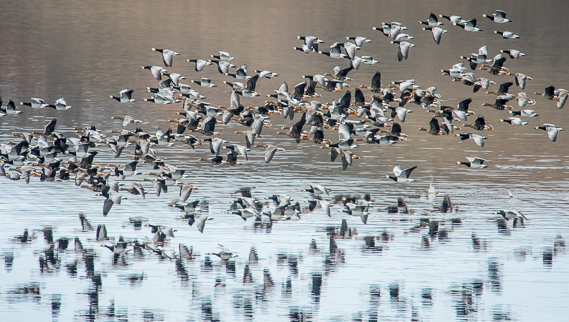 Wasted energy in continually moving to feed is not conducive to giving them the best possible chance of reaching prime condition prior to migration. We were heading back to the west of the reserve and it was fascinating talking to Tom about the balance of working the reserve for the breeding birds and the wintering wildfowl. 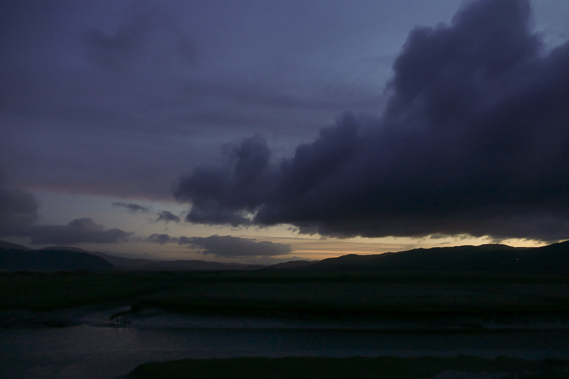 Pre dawn out on the salt marsh on the Dyfi estuary, but no White-fronts showed. The last count of the geese so far this year had shown thirteen and it’s important that Tom counts them at least a couple of times a week. A maximum count of twenty five were recorded last year so thirteen so far was not brilliant but could simply represent one extended family group that have not returned. The numbers could yet increase as well so it will be interesting to keep a watch on the final numbers for 2018/19. Ynys Feurig hide on the Ynys-hir RSPB reserve where we had spent the first couple of mornings looking for the White-fronts. Out onto the reserve with full daylight and a chance of catching up with the elusive thirteen. This was going to be our last chance this visit as we were heading back home, and the number thirteen still lodged doggedly and totally irrationally in my mind! To see them would be enough, to photograph them would be very special. Tom soon caught sight of thirteen geese flying west fairly high and split into two tight groups of four and nine. Tom had seen this before, the four being one family. I got them in the bins! 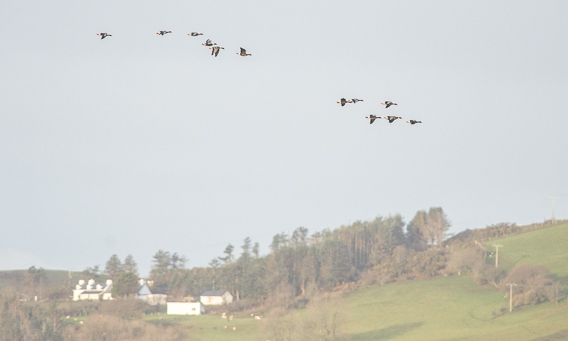 Here at last were the elusive Greenland White-fronted geese wheeling over the Dyfi. They banked and began to lose height whiffling as they dropped. Still a fair way off but Tom had an idea where they may have come down. First close views of the Greenland White-fronts on the Dyfi estuary. Rising soon after we had located them. A few more gates to open and close and we soon arrived at a field with a large bank running towards the estuary. 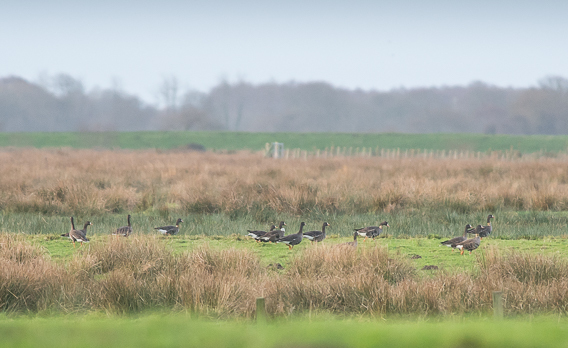 We approached slowly and cautiously to look over to the fields beyond and there about 150 yards away were the thirteen Greenland White-fronted Geese. They were feeding but appeared unsettled. We got the scopes on them and I managed a few shots. Within five minutes they were off again back east up the estuary. We followed then in the bins till we lost them over the other side of the estuary. Brilliant, more than we could have hoped for and a big debt to Tom for helping us to find them. The thirteen wheel round and head east down the estuary. Flying east we had fine views of them as they split nicely. I really hope that in years to come the Dyfi Greenland White-fronted Geese will increase and the work and effort of the partnership mentioned above is successful. It is a fragile population just about hanging on. I’ve been fortunate in seeing them here but desperately want my children to experience the same thrill on seeing this enigmatic wanderer from the arctic. 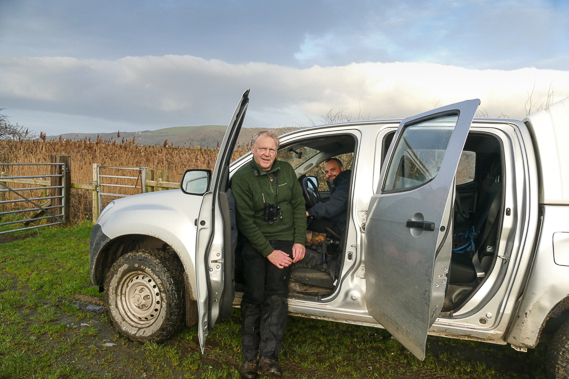 Tom Kistruck, the RSPB warden at Ynys-hir, and me. 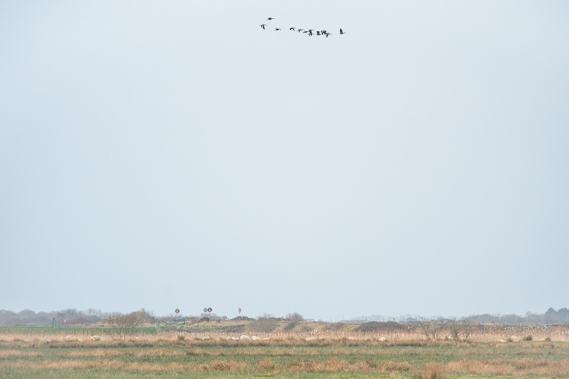 A huge thanks for Tom and his knowledge in helping finding the Greenland White-fronted Geese.